As a practicing doctor of Gonstead chiropractic for over 32 years I have dedicated myself to the process of assisting people achieve a pain-free and active lifestyle. The Gonstead system of analysis and correction is uniquely suited to the task of helping individuals achieve rapid and sustained improvement in mobility, function and well-being. While my primary focus is the specific correction of the vertebral subluxation, I am increasingly aware of how attention to the supportive aspects of healing and correction are vital in favorable patient outcomes. This includes nutrition, and more specifically, in the way that targeted nutrition affects and supports the circulation and restoration of intervertebral disc (IVD) tissue, as well as other supporting ligaments and connective tissue. As we know, the IVD is a very unique piece of human anatomy. Once considered little more than a spacer between the spinal vertebra, we now know that it is a very dynamic and crucial subset of the vertebral motor unit. Its vitality and resistance to stress is essential to the best possible outcome for those seeking chiropractic care. Spending my professional life seeking excellence in the area of specific disc correction has eventually led me to the more focused area of nutrition supporting micro-circulation, namely that circulation feeding the tissue of the IVD. As we learned in chiropractic college, the disc (along with the cornea of the eye) is unique in that it has very little direct blood supply. Much of the nutrient transfer to tissue cells of the IVD must come via mechanical convection. Some IVD cells are as much as 20-25 mm distant from a serving blood vessel, tremendous distance when considering the microscopic size of the cells and molecules involved. And we know that this mechanism is crippled with the presence of the entity that we professionally label – the chiropractic subluxation. If this capillary circulation is compromised, a result inherent in the subluxated motor unit, the cells dessicate (dry out) and starve nutritionally. Restoration of motor unit motion and function (via the specific chiropractic adjustment) has been and continues to be our primary method of correction. And what must come hand in hand with that correction is supportive nutrient supply to the cells of the IVD for tissue re-building. This is vital for complete disc healing and resulting optimal function. The nutritional science of nitric oxide synthesis reveals the importance of this nutritional support. Over 150,000 articles, white papers and items of scientific literature show us that an adequate supply of nitric oxide precursors (primarily available via an adequate nutritional diet) is crucial to cardiovascular physiology, tissue micro-circulation and ultimately intervertebral disc repair. The endothelial response subsequent to tissue stress (think subluxation here) provides the necessary capillary response leading to hydration and healing of the IVD tissue. This is where mindful whole-food nutrition reveals its value for the patient. RECOMMENDED NOTE TO SELF! EAT REAL FOOD! EAT FOOD THAT WILL SPOIL! Of course, my desire would be that every patient eat a nutritionally sound diet (e.g. locally sourced, organic, pesticide-free). That in a perfect world, refined sugar consumption, Omega 3/6 balance, ketogenic physiology, processed food consumption, etc. were all in optimal parameters. In reality I know that I cannot reasonably expect this; hence the value of high-quality, targeted nutritional assistance. SCHEDULE YOUR WELLNESS CONSULTATION TODAY! 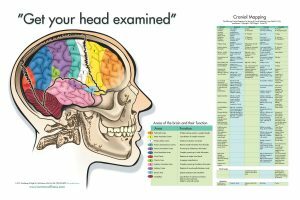 Ask about cranial adjusting and how cranial suture misalignments can negatively impact your health!